When typing is a large part of how you make a living, the muscle memory you develop while typing with your keyboard can be hard to shake. Before reviewing a new keyboard, I like to take some time with it to ensure that my impressions of how it performs aren’t colored by my personal preferences. Only after my typing is up to speed, which usually happens after a few weeks of using a keyboard, do I dig in. With that in mind, the Qwerkywriter S mechanical keyboard is very pretty and types beautifully. Unfortunately, its design (as its name suggests) contains a number of quirks that keep it from achieving perfection. The Qwerkywriter S is exceptionally built. 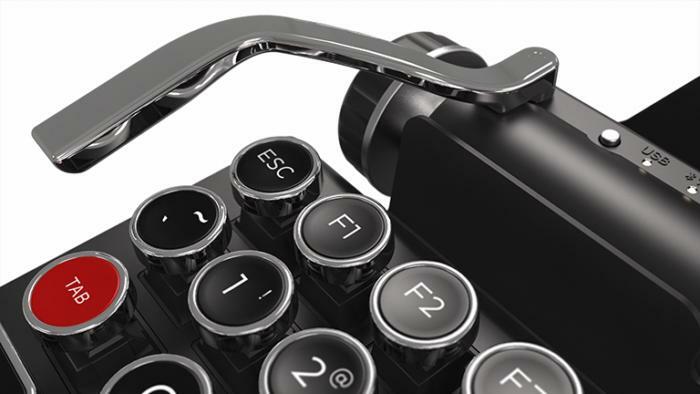 Its rounded, matte black aluminum body and chrome accents absolutely nails the aesthetic of a mid-century typewriter, with a look that reminds me of my old Remington portable. It’s heavy like a typewriter too, and it will stay exactly where you put it. Given the propensity of many lighter Bluetooth keyboards to slide around on my desk as I type, this heft is a welcome feature. It took about a week to become accustom to the Qwerkywriter’s round key caps. Each of the plastic key caps is finished with clear, easy-to-read stenciling that feels like it will last for years before fading. A slight indentation in each cap makes it easy for your digits to peck out the key. The Qwerkywriter S’s round keycaps could make touchtyping difficult for some users. Since the Qwerkywriter’s key caps are round—as opposed to the neat chicklet-style keys that Mac users are accustomed to—the spacing between the keys can feel massive at times. When comes to providing an overall sound, mechanical keyboarding experience , the Qwerkywriter S, with its Cherry MX switches, delivers. The keyboard’s rollover is excellent, as are the pitch and travel of its keys. Touch typists (provided they can live with the feel of the round key caps,) will love this thing. The Qwerkywriter can be paired with three different devices—an iPhone, iMac, and iPad, for example—and switch between them with the push of a button. If you do choose to use it with a tablet or smartphone, you’ll be glad to know that the keyboard comes with a built-in stand, positioned to make it look like the device you’re using is a piece of paper fed into a typewriter. However, the position of the stand cannot be adjusted, so taller users may quickly find themselves working with a kink in their neck. I found that a charge of the keyboard’s battery would last me for around two week’s worth of writing. The keyboard is charged via a microUSB to USB-A connection. That it wasn’t equipped with USB-C connectivity, given the growing dominance of the standard in the computing world, feels like a serious misstep. 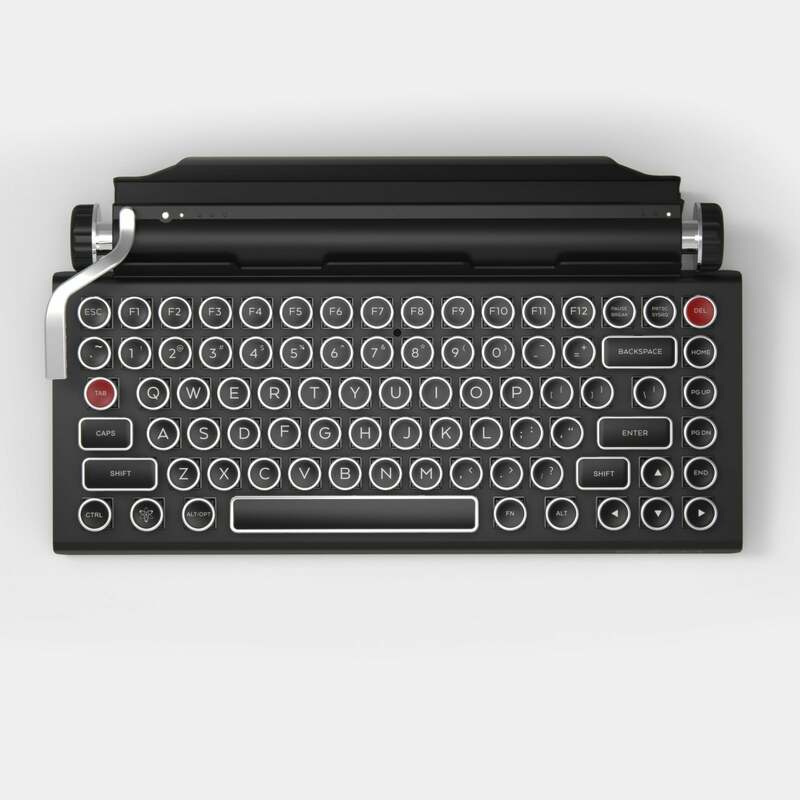 The Qwerkywriter’s design is meant to be a throwback to a time when typing was an entirely mechanical affair. Back in the day, to advance or retreat in the page you’re typing, you had to to thread it, forwards or back, using a wheel at either end of the typewriter’s carriage. The Qwerkywriter S has those wheels; one allows you to scroll through the text that you’re working on (it’ll scroll through webpages, as well); the other wheel is a volume control. I love the concept, but I seldom used the wheels. Document scrolling is far easier with a mouse or trackpad, or, on an iOS device, a finger flick. What’s more, the keyboard’s scroll knob doesn’t work across the board on all text-based apps in iOS. This proved more than a little frustrating during testing. The Qwerkywriter’s most iconic feature, a working carriage return/enter lever, can be problematic. Computer users have spent decades hitting the Enter key to begin a new paragraph. Even most typewriters, in their final years of word processing dominance, did this. As a vintage typewriter aficionado, I dig the aesthetic of the Qwerkywriter’s carriage return bar, but I can’t get behind its functionality. Asking typists to commit to using the lever to move to a new paragraph in their writing is asking a lot of their muscle memory. Apparently, the keyboard’s designers thought so too: the keyboard, despite being equipped with the carriage return lever, it also has a conventional Enter key. The Qwerkywriter S’s carriage return bar complete’s the keyboard’s vintage look, but feels superfulous. As Qwerkytoys is quick to point out, the carriage return bar can be reprogrammed with other macros. Even after doing this, I found myself happier when I ignored the carriage return as a feature. Qwerkywriter’s carriage knobs are just as superfluous: the keyboard comes with volume keys baked into it as well. This failure to commit to the conceit of being a computer keyboard that’s designed to look, feel and for the most part, operate as a manual typewriter once did is, perhaps, the Qwerkywriter’s greatest flaw. When used with Apple devices, important, often used keys, like the Home Button for iOS, and media control keys can only be accessed while holding down the keyboard’s Function key. Noting that the Quirkwriter was sporting Print Screen, Home and Page Up/Down buttons, I also gave the keyboard a spin with my Microsoft Surface Go. Navigating keyboard shortcuts in Windows 10 proved no easier. The Qwerkywriter S feels nice to type on and is well built, but its signature features feel more like a curiosity than a necessity. If you favor functionality over aesthetics, you may cringe at the Qwerkywriter’s high price. ← Mingis on Tech: What's coming in the Windows 10 October update? September 19, 2018 Tech News Comments Off on Mingis on Tech: What's coming in the Windows 10 October update?